The story of some of the most significant popularized to “Gangster rap”. A genre that not only spoke out for the inner streets of Los Angeles, however for the entire West Coast hip hop movement. As hip hop music was evolving, many didn’t realize that a young designer from Brooklyn, with huge aspirations was launching a new clothing collection, at the same time. This was the beginning of a brand fueled by hip hop! “AZ”, Karl Kani’s childhood friend reached out turning Kani on to a new underground group named “NWA“, from Cali. AZ was certain that “NWA” was about to “BLOW UP!” Kani got his hands on an Eazy-E cassette tape; he couldn’t ride around Brooklyn without blasting the new gangster track. According to Kani “The vibe and the music was SICK, it was different; it changed hip hop”. The Karl Kani collection was featured by Eazy-E in his video “Real Muthaphuckkin G’s”. “The last time I saw Eazy, before he passed away, was 2 days before Christmas, at the South Coast Plaza Mall in Orange County. I told him good looking out rocking that Kani! Eazy was like all good. Eazy-E wasn’t the only one spotted in Karl Kani. Back in 1992, Karl first connected with Dr. Dre, after he left Ruthless Records. During this time, Karl Kani wasn’t independent, and was still partners with Cross Colours. Dre and Snoop Dogg came down to do a photoshoot. “Dre and Snoop were crazy cool and real! Eventually, I knew an opportunity would present itself for Dre and I to discuss my clothing line. A few years later, when Dre left Death Row Records, the two reconnected. Dre decided to do a photo shoot for the Karl Kani line, it was a pivotal moment for the Karl Kani brand. “We dressed ALL members of NWA; that was MONUMENTAL in hip hop! The Karl Kani line was also featured in Dr. Dre’s ‘Keep their heads ringin’ video. Stylist, Kenya Ware, owner of ‘A Buzy Girl Productions‘ confirmed, on her Facebook page, the Karl Kani sweatshirt worn in the new ‘Straight Outta Compton’ film, is going to be the white trademark hoodie, a replica of a sweatshirt worn by Dre, back in the day. Although I didn’t grow up during the era of the beginning stages of hip hop, I still recognize legends. Young or old, many share one common interest, music. Music doesn’t discriminate against where you come from and economic status. There’s a story behind the music that we can all identify with, on some level. 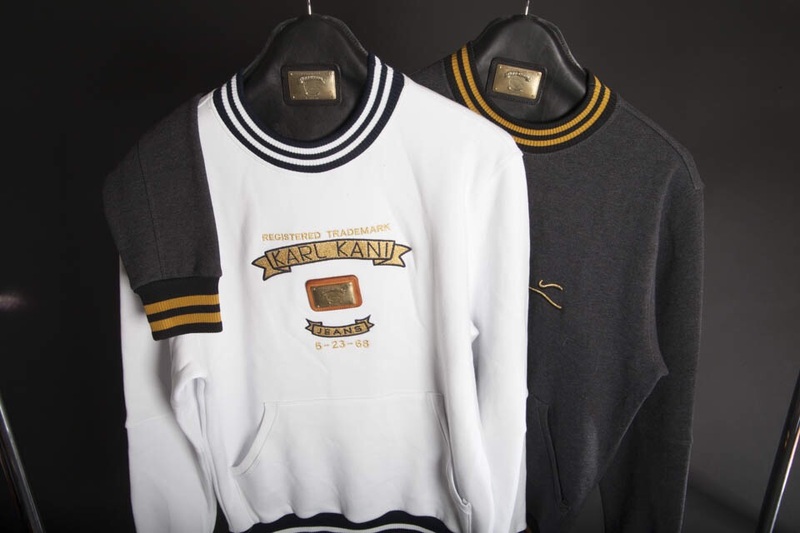 Karl Kani is reviving his brand within the the hip hop industry. His well regarded brand is still being represented by so many. Kani plans to continue to evolve in this industry with no end in sight. Check out the gallery for some throwback N.W.A x Karl Kani pictures. THANK YOU KARL KANI ‘CAUSE YOU’RE PART OF HIP-HOP HISTORY LIKE N.W.A., EAZY-E (R.I.P. ), DR. DRE & THA ROW, 2PAC (R.I.P.). I HAVE GOT 2 KANI’S JEANS & I’M PROUD OF IT ‘CAUSE I LOVE HIP-HOP !!! GOOD 2016 KARL KANI !!! I WOULD LIKE TO THANK YA ‘CAUSE YOU’RE THE GREATEST HIP-HOP STYLIST OF ALL TIMES SINCE 1989 & I’M PROUD TO HAVE GOT KANI’S JEANS !!! I WISH A GOOD YEAR TO YOU, YOUR FAMILY & TO EVERYBODY WHO LOVES HIP-HOP, R&B, SOUL, FUNKY & KARL KANI ALL AROUND DA WORLD !! !